Hi everyone! Jenny here from The Dot Couture. 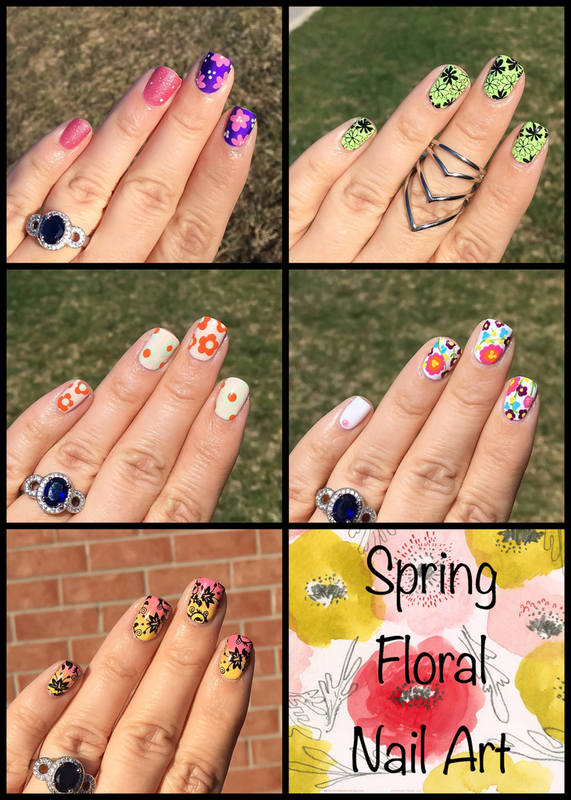 Today I have some Spring floral nail art to share with you. Spring has sprung in many parts of the world (although I’m still waiting!) 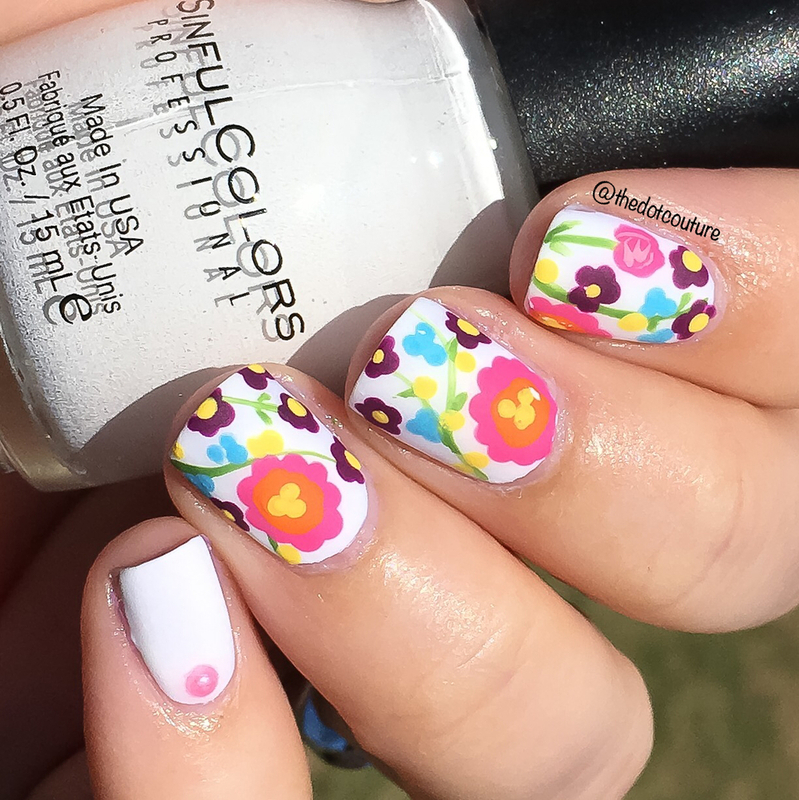 and with it comes bright and cheery floral manis. 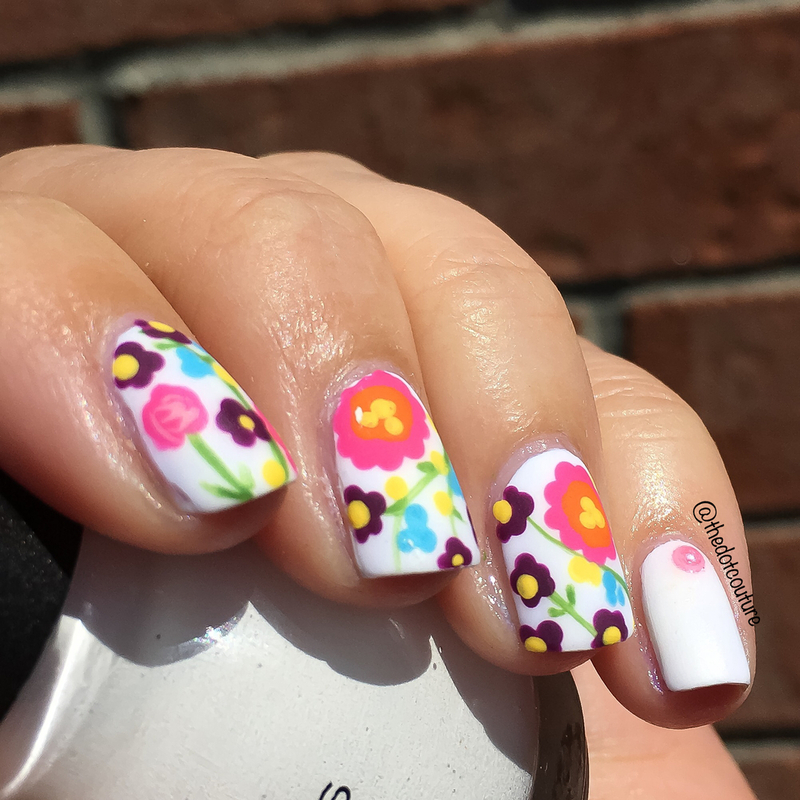 First up I have a simple freehand floral mani. 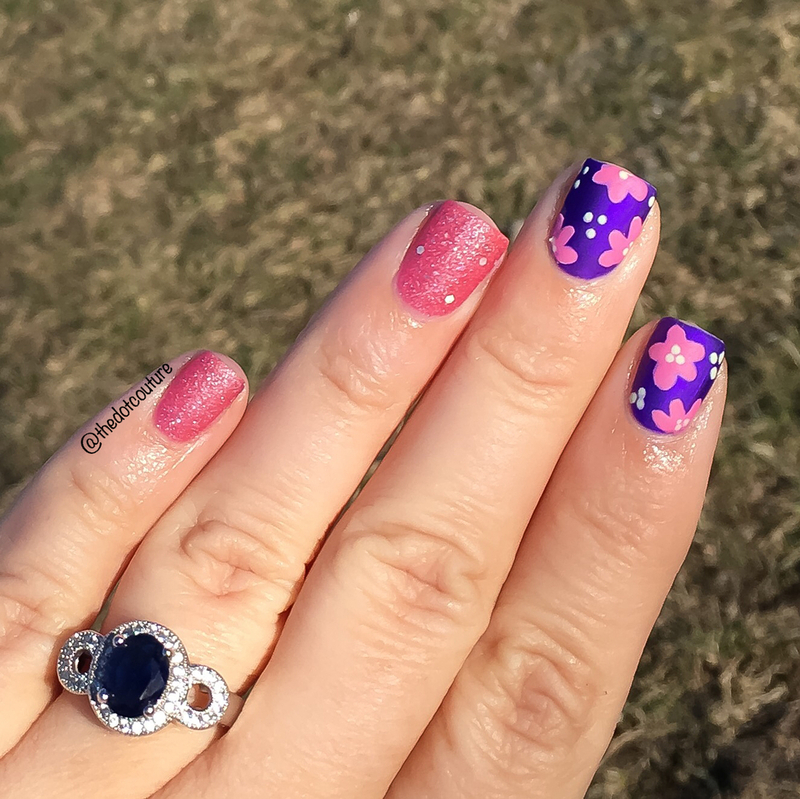 I often like to go with non-traditional colour combos – I love how the dark purple really showcases the pink flowers. To do this mani I used the end of a bobby-pin and sort of dragged the petals inwards. 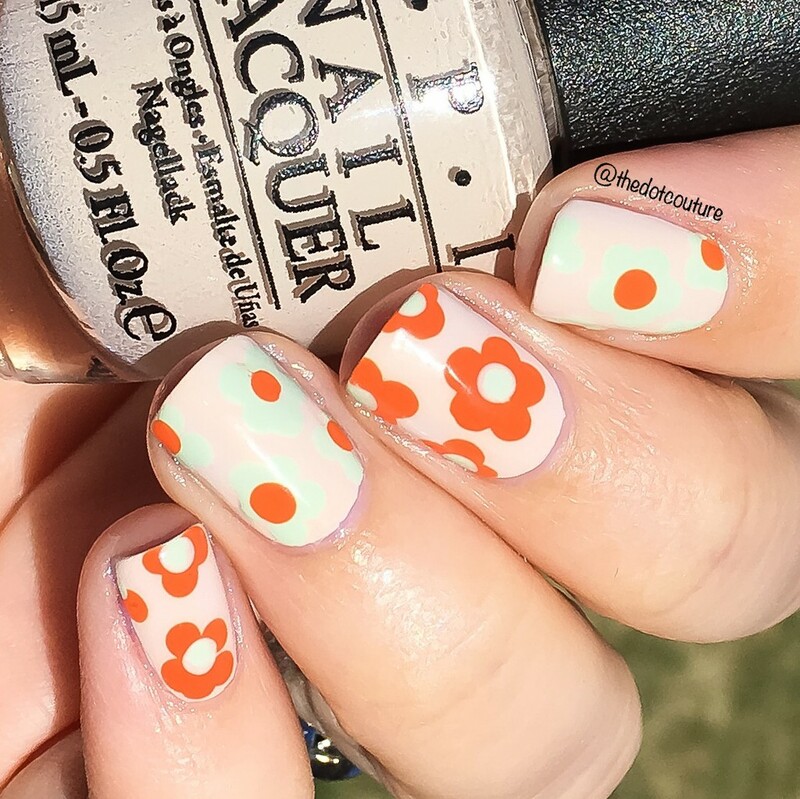 If you feel overwhelmed by doing all of your nails, a simple trick is to do one or two accent nails in a more detailed pattern and then use a complimentary polish for the rest of your nails. Here I used a textured polish from Nicole by OPI. I added a matte top coat to see how it would look. So cute right? 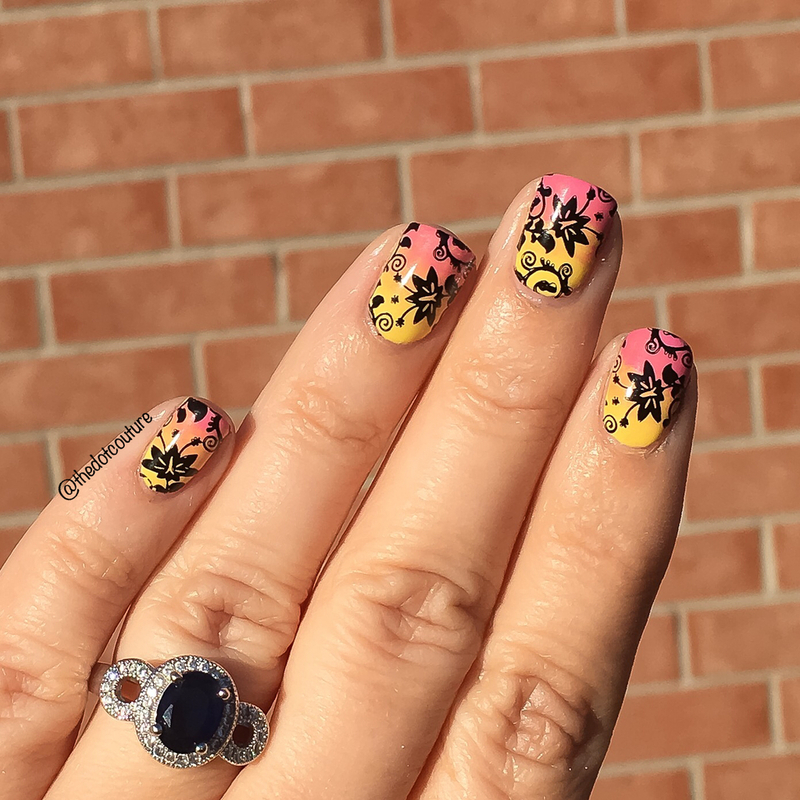 Another way I like to do florals is stamping. 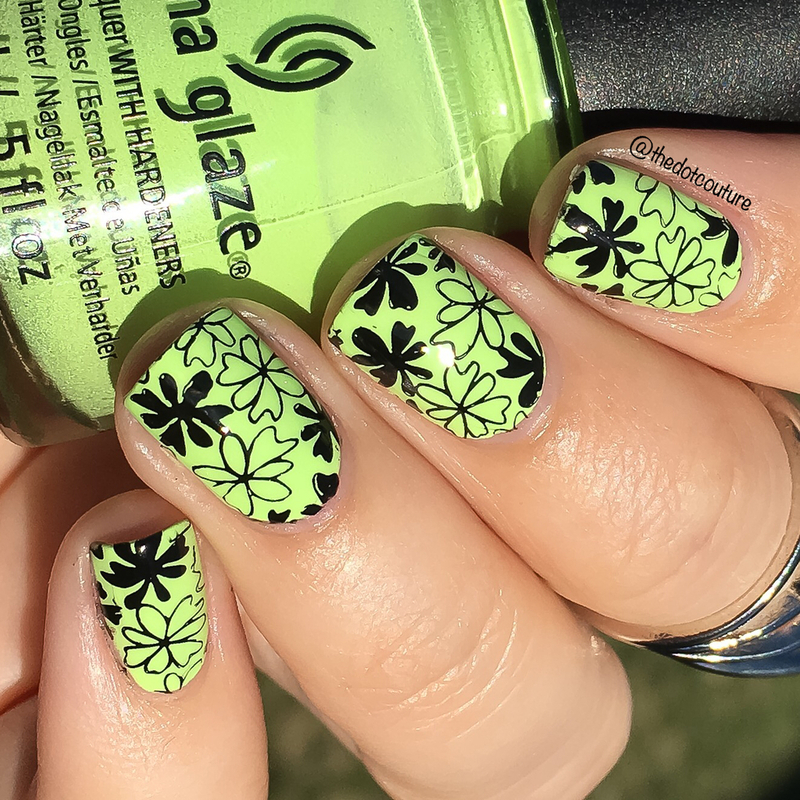 Here I used a beautiful bright lime green polish (this is Grass is Lime Greener by China Glaze) and stamped over it with a black stamping polish. Stamping is a great alternative if you don’t feel confident enough to freehand. 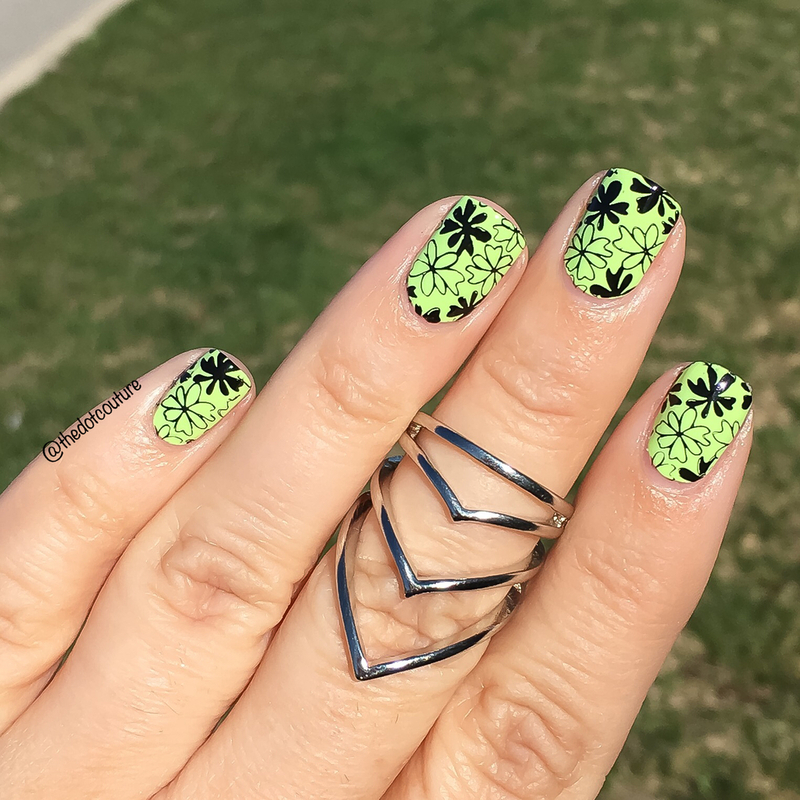 With enough practice stamping is a really quick way to create really unique and interesting manis. 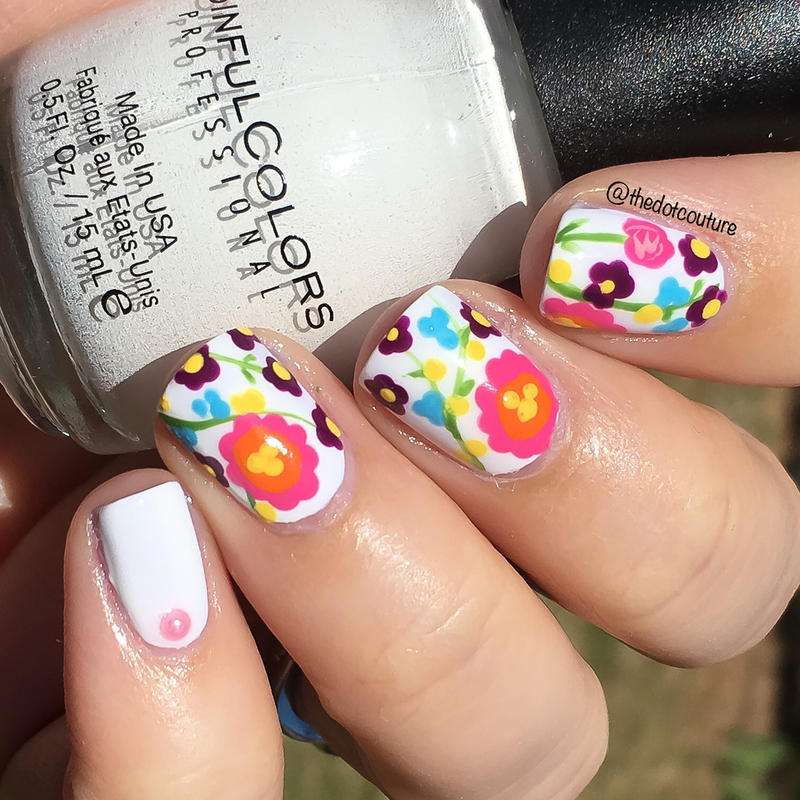 Next up is the simplest way to do florals. 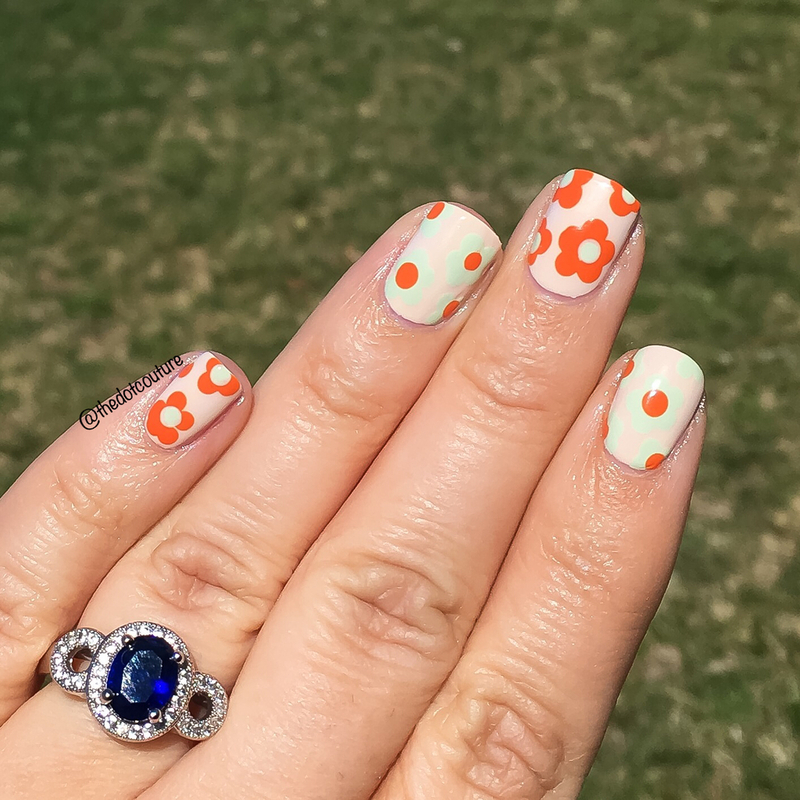 I used a dotting tool (you can also use the end of a bobby pin, a sewing needle, or a toothpick) and created a simple daisy by dotting 5 dots in a circular pattern and then using a contrasting polish dot right in the centre. I used an orange and mint green colour palette but the possibilities and combos are really endless. And it only takes a couple of minutes to do! The most complicated-looking would be these freehand nails but I promise it isn’t as difficult as you would think! The trick to these is acrylic paint!!!! After I painted my white base I top-coated with a quick-dry top coat. Then I went ahead with my acrylic paints (I got mine at the dollar store for 2 dollars each). The beauty of working with acrylic is it doesn’t dry as quickly as nail polish and it doesn’t get goopy. I kind of just started painting various floral patterns on my nails until I was happy with the end look. If you mess up with acrylic you can gently scratch or wash it off of your nail. It’s also very opaque so you should only have to do one coat. If you are careful and don’t glop it on, it will dry quickly as well!!! I loved the finished result. I left my pinky white and used a nail gem I got from Amazon. Then I wanted to see how it looked with a matte top coat. I think these are my favourite nails I’ve done all year!!! Anything goes with this type of look, they seem complicated but they are just really dots and lines and although they may take longer, the pay-off is well worth it! And for my last look I created a gradient using an artist’s fan brush I got from Amazon. I painted my nails yellow and then put drops of yellow and pink polish on a coffee lid (acting as a paint palette). I then used the fan brush to pick up the two colours of polish and just swept the brush from side-to-side on my nail to create the gradient. This was only one pass and I loved the end result! I then stamped over it with a floral stamp and black stamping polish. 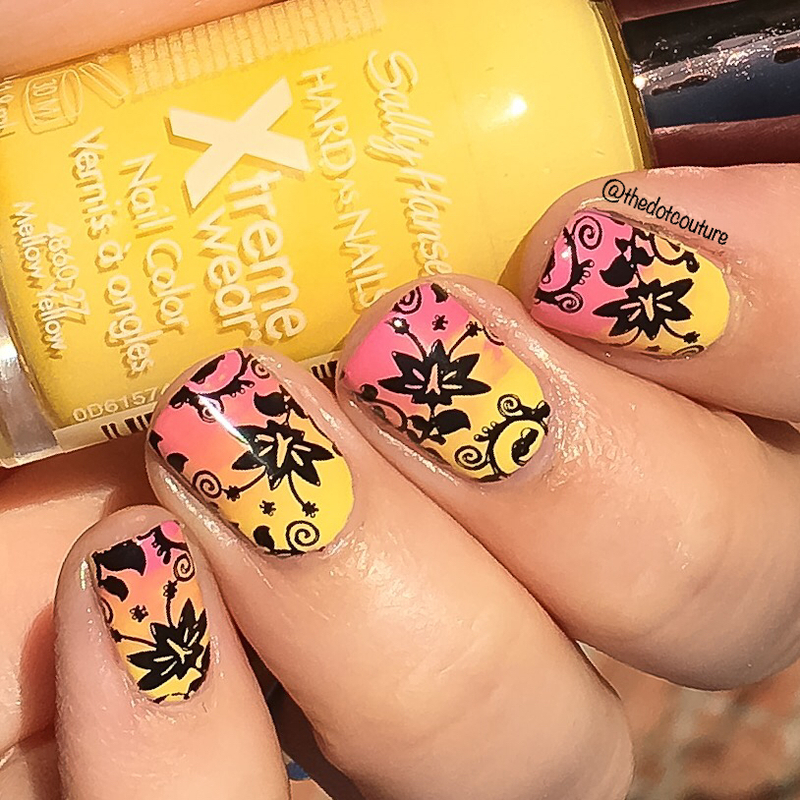 I love the pink/yellow combination – it reminds me of lemonade for some reason! And a little secret to nail art – top coat!!!!! Sometimes you do something that looks like a big old mess on your nails but once you add that top coat, magic happens. It just sort of flattens, softens, and blends it all together. I always advise investing in a good, non-smudging, quick-dry top coat. So what do you think of these looks? 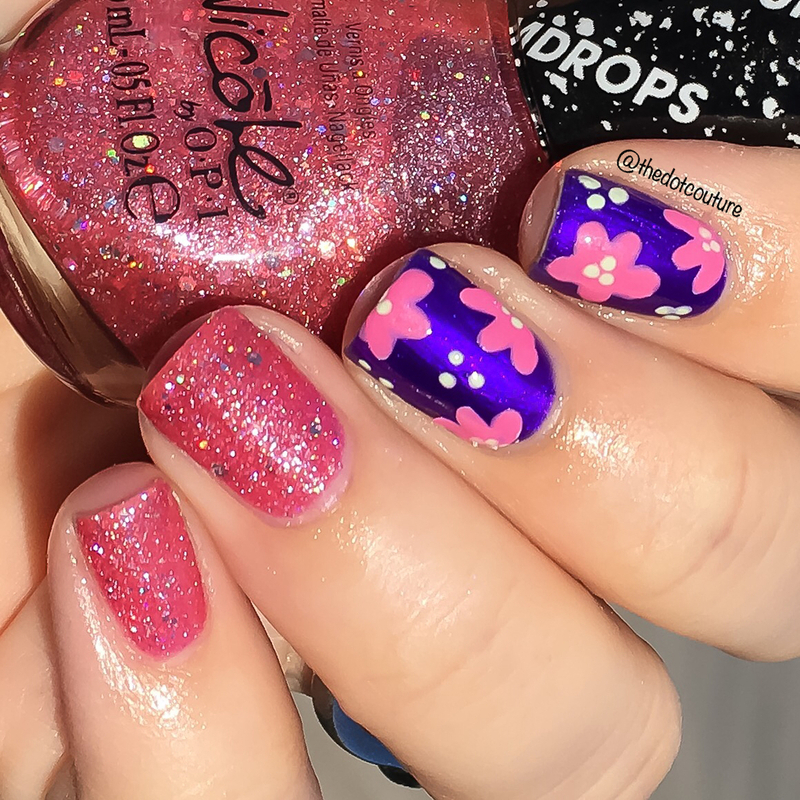 Would you wear any of these on your nails? Which is your favorite? For more cute nail art, come check me out on Instagram at @thedotcouture. Until next time, happy painting!!! !